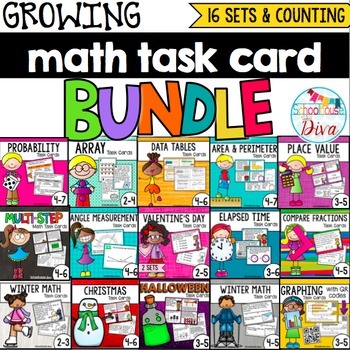 Math Task Card Bundle! 370 task cards (16 sets!!) at 20% off! All recording and answer sheets are included! Sold separately, these cards would cost $47.50. This can be used with students between 3rd and 6th grade, depending on skill level. Task cards will be added as I make new ones and the price of this bundle will be raised! If you buy now, you will save on every set of task cards that I am able to add to this set! Check out another great activity! Be the first to know about sales and freebies! All of my products are 50% off for the first 24 hours. Be the first to know about this by following my store! * Click on the green star at the top of my page to become a follower !